On Monday the BFS Girls Varsity Softball team defeated Birch Wathen Lenox 23-10 in the ISAL Semifinals at Van Voorhies Field. The team improved its overall record to 9-5 (5-1 in the ISAL). We will face LREI on Wednesday in the ISAL Finals at Van Voorhies, first pitch scheduled for 3:45pm. Blue Pride!! The team took the field in one of the nicest days of the season for its semifinal match up against BWL. The team did not get off to the best start as BFS walked their opponents first four batters. Sophomore pitcher Taty R. finally found some type of rhythm and was able to start throwing strikes as she struckout the side, but not before giving up three runs. So BFS found themselves in a little whole going into the bottom half of the first inning. Their opponent was missing their number one pitcher as she could not attend this game. As BWL’s pitcher also struggled to find the strike zone, BFS picked up walks and hits, which led to base runners, and runs for BFS. After one inning of play BFS was now up 13-3. Taty continued to struggle on the mound. She picked up the first out herself as she calmly caught a grounder and threw over to first base for the putout. But after that one she walked four out of the next five BWL batters. Once again BFS gave up three runs. BFS batted around again and then some this time picking up eight more runs and adding to their lead. After two innings of play BFS found themselves up 21-6. Coach decided to rest Taty for Wednesday’s possible championship game and get junior Julia B. some more work on the hill. Julia B. also found herself struggling as she had trouble with BWL’s first three hitters, but after that she settled in nicely. She gave up three runs in the third inning and only one run in the fourth inning. BFS tacked on two more runs during the bottom half of the third inning and cruised to the 23-10 playoff victory. Everyone who attended the game shared in this victory. Everyone who did not make it to the playoff game for various reasons, we hope to see you on Wednesday at the finals. This is the third time in three years that BFS has made it to the ISAL Championship Game. This is a tremendous accomplishment for the team, its seniors, and all the players and coaches. BFS will look to play one of their best games of the season as they take on the leagues best pitcher and the #1 team during the season, LREI. Blue Pride Runs Deep, Friends Forever!! The BFS Boys Varsity Volleyball team defeated Berkeley Carroll 3-0 (25-8, 25-15, 25-13) in the upper gym. The team improved its overall record to 14-1. As they approach the playoffs, the team continues showing signs of greatness. Today they won their last division match of the season to finish with a perfect 10-0 record in their division. From the beginning of the match to the end, the team took control and maintained it throughout. Thomas C. continues his dominance, this time posting 11 kills, 2 aces, and 4 blocks. 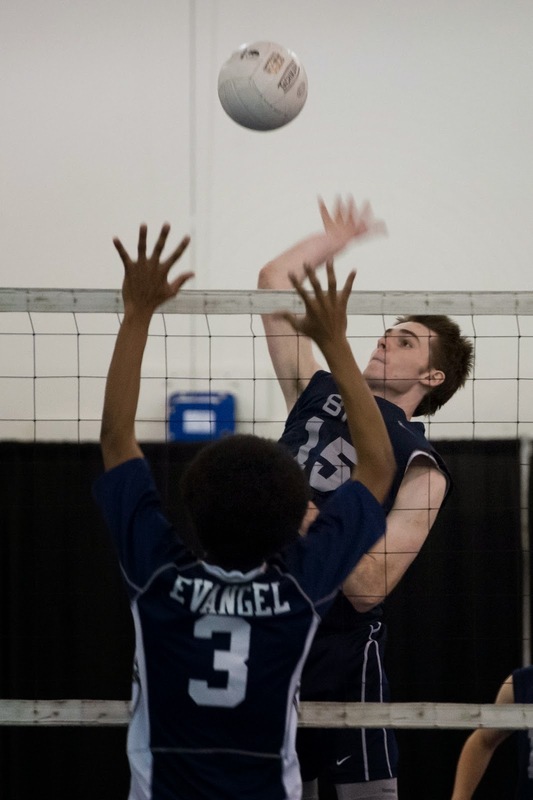 Griffin E. continues to show lots of confidence controlling the transition, as he finished with 17 assists and 2 aces. Philip C. and Lucas M. continue to play well, side by side, as well as on the net, as they combined for 7 kills, 3 aces, and 2 blocks. Quran D. and Tyler V. continue growing as players, both offensively and defensively, contributing with 2 assists, 2 blocks, and 2 kills. Overall, today was another great team effort. Blue Pride!! The BFS Boys and Girls Varsity Outdoor Track team participated in the ACIS Championship Meet down at Red Hook. 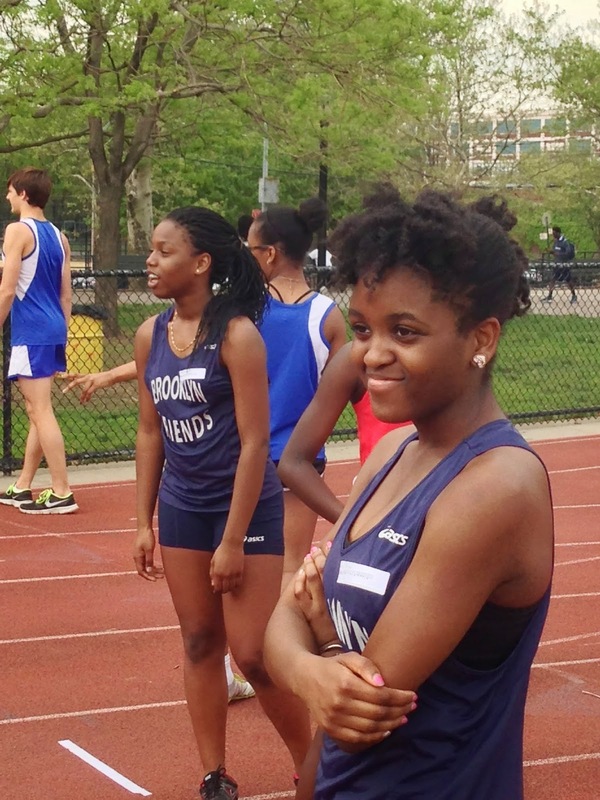 The Brooklyn Friends track team had their final meet at Red Hook on Monday. Five runners competed in the ACIS Championships. Naomi M. and Alexia S. started BFS off in the 100M. The runners were placed in four heats and the top six times advanced to the final. We, unfortunately, did not place anyone in the final. The competition was strong given it was the Championship meet. Nevertheless, Naomi and Alexia competed well. They demonstrated a comprehension of the mechanics and techniques we have discussed this season. They are both only freshman. We know next year will bring great improvement and a possible spot in the finals. Jacob I. and Nat E-H were next up in the 1600M. Jacob devised a smart strategy to mark a runner from Packer. This strategy meant he aimed to run along with a runner identified to be close to his capabilities and hoped this runner led him to a good time. Nat looked to improve on his first race ever from the previous week. Jacob immediately learned the runner he marked was on his way to a breakout performance and had to back off his plan to shadow him. His quick adjustment salvaged his race as he ran a 5:39 mile which was only two seconds off his best time. Nat ran a personal best time. Another furious kick down the home stretch helped him run two seconds inside his time from his first race. More familiarity with pace and strategy will yield serious improvements for Nat next season. Finally, junior Giovanna M. ran the 1500M. She was in the hunt to place in the top six. The other runners, however, had a few more races under their belts which aided their performance. Still, Giovanna finished seventh overall. Her plans to run a half marathon this weekend remain in tact which will be a nice end to her season. Thanks to all our runners and coaches this season. We look forward to getting back out there. Blue Pride!! 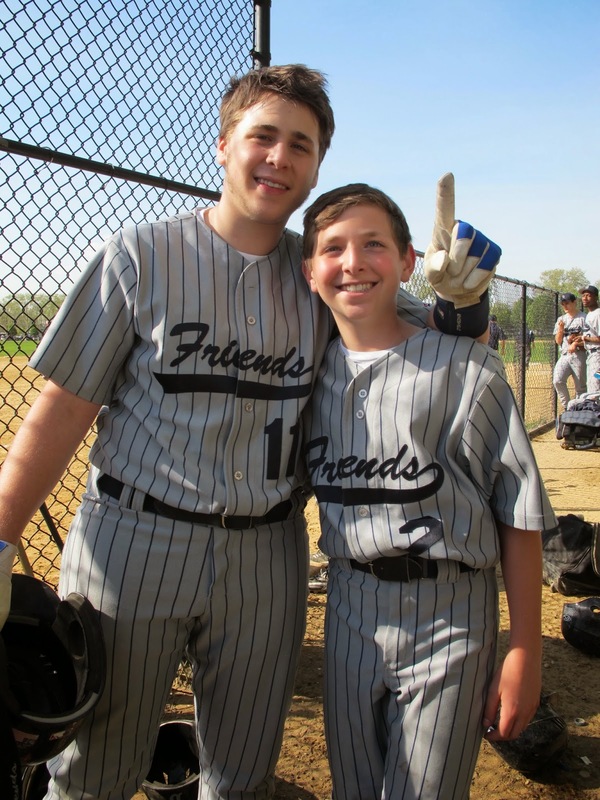 On Tuesday the BFS Boys Varsity Baseball team defeated Martin Luther 7-5 down in Red Hook on a beautiful day. This was the teams final regular season game. The victory keeps BFS’ playoff hopes alive, as they are currently scoreboard watching to see where they finish in the final league standings. Senior Adam G. led BFS as he was strong at the plate and on the hill carrying the team to victory. Adam went 3 for 4 with a double and a triple for BFS. He doubled in the second inning and tripled in the sixth inning. Although the team allowed 5 runs in the game, none of them were earned as the combination of freshmen Emmitt S. and Sam G. as well as Adam G. combined to allow just one hit over the seven inning contest. For Emmitt it was his first start on the mound this year and for Adam G. it was the first save of his high school career. The Panthers came out swinging, scoring three runs in the first inning to jump ahead of Martin Luther early. The Panthers scored in the first on an error, an RBI double by junior Adam W. and a hit by pitch. In total BFS had 11 hits on the day, their best total of the season. After the win to climb to 4 wins and 4 losses in the PSAA DII League (overall record of 4-6), the team waited for word from the LWA vs UNIS contest that would decide the school’s playoff fate. The team didn’t have to wait long, as they traveled back to the school on the bus, it was learned that with a 6-5 UNIS loss the Panthers indeed did earn the fourth and final playoff spot in the league. Next up for the Panthers is a playoff game with Bay Ridge Prep on Thursday. Come out and support the team as they take on BRP at Bay 8th Street Field #3 in the PSAA Semifinals. Blue Pride!! On Wednesday the BFS Boys Varsity Volleyball team defeated York Prep 3-2 (22-25, 25-11, 25-19, 22-25, 15-9) in a nail biter in the upper gym. Today was a great test of endurance and mental focus in the teams last regular season match. You couldn’t ask for a better game to get you ready for the playoffs. This match tested our six players (Thomas C., Lucas M., Griffin E., Quran D., Tyler V., Philip C.). They played hard and kept up their intensity throughout the match. After dropping the first set, the team regrouped focused as they dominated the second and third sets; then York pushed back and took the fourth set. During the 5th and deciding set, we knew we had to push hard and stay strong and consistent, dominating every aspect of the game defensively and offensively! Overall, it was a great team effort and a great reward for a successful regular season finish (15-1). The team is looking forward to continue their great rhythm during the playoffs…Blue Pride!! The BFS Girls Varsity Softball team traveled down to Van Voorhies Field to take on the LREI in the ISAL Championship Game. #1 see LREI versus the #2 seed BFS, these two team also squared off last year in the finals. Both teams played a great and it was a fantastic Championship Game. LREI came out on top and defeated BFS 5-2. Both teams went down in order during the first inning. BFS got a lead off hit from senior Chloe B., but she ended up getting stranded at third base. LREI managed to score one run in the second inning as their lead off walk ending up crossing the plate to give them a 1-0 lead after two innings of play. BFS led off with three hits to start the top of the third inning, junior Sage M., sophomore Naya C., and freshman Ivy L. managed to get on base. BFS continued to make contact during the inning but some of the balls did not bounce our way as BFS picked up only two runs. Chloe B. hit a hard grounder to shortstop but LREI made the strong play getting Chloe out by a step, which saved LREI two runs. So, BFS was able to tie the game at two, but wanted more. LREI’s pitcher and number three hitter led off the bottom of the third inning with a single and ended up scoring to once again give LREI the lead. This time it was for good as BFS did not reach base again in the final four innings, striking out four times and grounding out seven times, as well as one line drive back to the pitcher. LREI tacked on two more runs during the bottom of the fifth inning. BFS pitchers sophomore Taty R. and senior Julia G. who came in late and got BFS out of some trouble did a fantastic job. BFS will once again look to get back to the championship game for the fourth straight year as it takes the field next year. Thanks to all our players, coaches, and fans!! A special thanks goes out to our senior leaders Chloe. B, Julia G., Anna E., and Sarah M. Blue Pride Runs Deep, Friends Forever! !